If you only have one printer in your classroom that you want to share with several student computers, you can connect that printer to your computer and then share it so that it is accessible from any computer in the room. To share a printer, you must first add it to your system the same way you add a printer that’s directly connected to your computer. 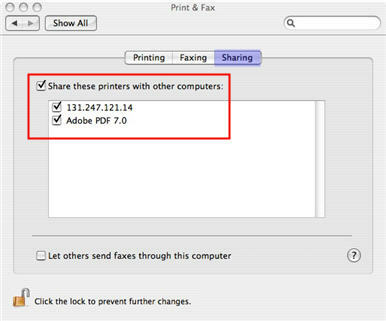 Once you have successfully installed the printer, select System Preferences from the Apple menu, then Print & Fax, and click on the Sharing tab. Check the box next to Share these printers with other computers, and use the checkboxes to select the printer(s) you want to share with other users.